I am often a very lucky girl. 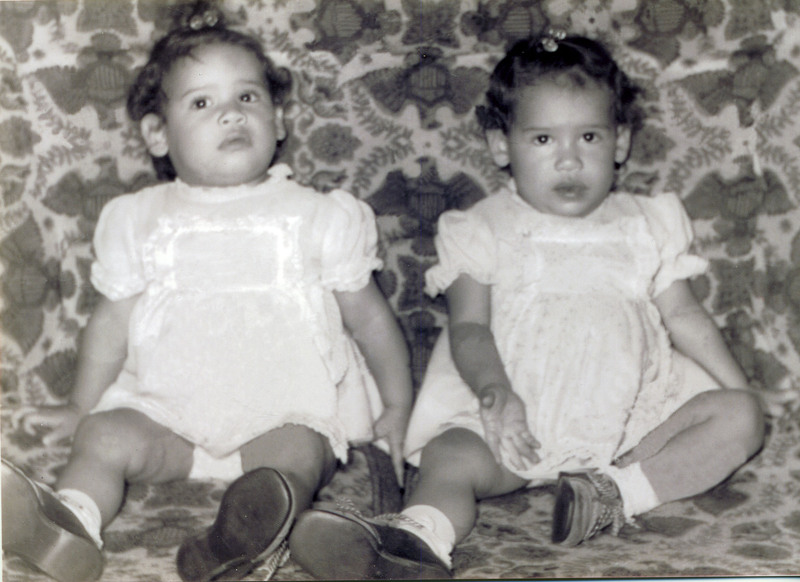 About six weeks ago, as I was marketing Bead One, Pray Too to independent bead stores, I received a call from Ann Tristan, co-owner with her identical twin sister Anita, of Bonita Bead Boutique in Maumee, Ohio. Ann thought the book sounded like a good fit for the store, where they regularly offer a rosary-making class, and where she makes and sells “inspirational jewelry” with semi-precious stones and sterling silver charms. Ann asked if I had a trunk show. A trunk show! WHY DIDN’T I THINK OF THAT? Well, I am just lucky Ann did. For those of you who may not know, a trunk show is a display of a designer’s or company’s wares. They are usually for sale, but mine are for display only, as many are my own personal prayer beads and my purpose is not to sell prayer beads, but to get people to make their own and reconnect through them on their own, unique faith journeys. So about two weeks ago I tagged about 12 sets of prayer beads and packed them in a box – malas, subhas, rosaries and prayer beads all jumbled together – and sent them off to Maumee. Now through Mother’s Day, Bonita Bead Boutique will display them with the book and help customers pick out the makings of their own prayer beads. You can see their publicity for the trunk show here. 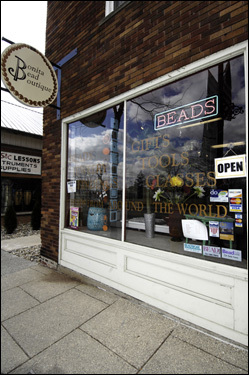 So if you’re anywhere near Maumee – a suburb of Toledo, I believe – and you’d like to see the prayer beads in the book and browse Ann and Anita’s wonderful selection of beads from around the world (ask about the “Buddha beads”), I hope you’ll go. And if you do, take a couple of pictures and send them to me. I wish I weren’t 2,000 miles away from my first trunk show. And if you can’t get to Maumee, check out the “Bonita Bead Gives Back” page on their website. Look designer Susan Matych-Hager‘s breast cancer bead – wouldn’t four or five of those make great cruciform or Our Father – or any kind of – beads for someone with breast cancer? And the store raised over $1300 for Beads for Life. Ann and Anita ROCK! Last time we explored a single form of prayer beads, we looked at those used by Baha’is. Really, no rhyme or reason here – I just feel like exploring the Pearls of Life next. The Pearls of Life – sometimes called The Wreath of Life – are one of the newer forms of prayer beads. They are Lutheran in origin and popped up within the last 20 years. They were created by Martin Lonnebo, a bishop in the Church of Sweden, who spent time on a trip to Greece contemplating the use and meaning of icons. You can read an interview with Lonnebo about the Pearls here. 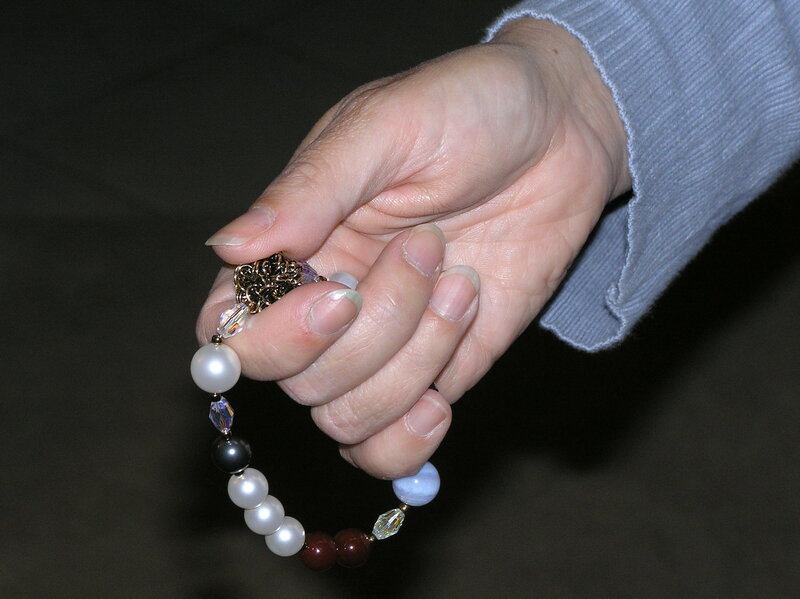 The Pearls of Life is a smaller form of prayer beads, with a total of only 18 beads – 12 round ones and 6 oblong ones. Traditionally, it has no religious totem – no cross, crucifix or other symbol. Lonnebo has assigned each of the beads a specific symbolism, which you can read about here. Like many of the newer forms of prayer beads, the Pearls of Life have no proscribed prayers – the user is free to assign any prayer he or she likes to any of the beads. It is a free-form prayer tool – you can sit in meditation and use it as an anchor for breathing, or you can use it more like a traditional rosary, reciting one, two or more prayers on the beads. You choose. I recently made my first set of Pearls of Life. I am a notoriously literal person, so I went first to the synthetic pearl section of my local bead store, Baubles and Beads. But when I started to let my imagination go, I found myself in the semi-precious section, the glass section and the metal section. I came home with pearls, jasper, glass and blue lace agate beads. And for the all-important God bead, I found this great sphere of wrapped brass wire – it is hollow, sturdy, prickly, round, cool to the touch – but the metal picks up the heat of my fingers very quickly. Talk about symbolism! When you make your own set, feel free to explore the form. You don’t have to make it of round and oblong beads – you can distinguish your beads with other shapes or only with color. And if it suits you, add a charm or two. You can replace one or more of the beads with a cross, a heart, a star, a tassel, a flower – anything. See Deborah’s J.’s great set where she used a butterfly to represent the Resurrection Pearl – a fabulous idea. Now go make some prayer beads – and send me pictures of what you come up with and what prayers you choose. I have been happily busy the last two weeks with my freelance work and some of it has really paid off – if not in $$$ then in notoriety. On Monday, a story I wrote for Religion News Service on the history of the religious polygamists in Texas ran in USAToday and about a week earlier, another story I wrote for RNS on protesters at the San Francisco Olympic Torch run appeared in several mid-sized papers, including the Albany Times Union and the San Antonio Express. And I am currently wrapping up a story on Christian suspense fiction for Publishers Weekly, which will run next month. In between, I went to a seminar called Re/Covering Islam at USC’s Annnenberg School of Communication and wrote the background materials for a ReligionLink “webinar” on Islam and politics. Whew! All of which has kept me from writing as much as I want on this blog. Watch for two upcoming posts, one on the Lutheran Pearls of Life and another on a “trunk show” of the prayer beads that appear in Bead One, Pray Too that is on display through mid-May in an Ohio bead shop. Hopefully, the same trunk show will be coming soon to a bead store near you as I work to get it booked around the country. Hey, if you haven’t been there in a while, visit the blog Paternosters. Blogmistress Chris Laning recently came back from a two week trip to Europe and has some interesting posts about historical rosaries she saw there. Also, check out her posts on a two-day rosary making workshop she took in Leiden – hate her!!!! But also look at the pictures of some very pretty modern rosaries she posted. What a nice way to start a Monday! In my email queue this morning was this post about “healing beads” for children from Beading Daily, a publication of Interweave Press, which publishes Beadwork magazine. The story is about the Children’s Healing Arts Project, which brings beading projects to children and their families in hospitals. It is a project of the Portland Bead Society in Portland, Oregon. Read and enjoy – and note the section at the bottom where they ask people to contribute their own experiences about how beading has been a healing practice. Prayer beads, anyone? As I wrote in an earlier post, a couple of weeks ago I attended the national conference of the Prayer Quilt Ministry in Dallas, Texas. The two-day meeting had talks, field trips and break-out sessions. One of those sessions was on making prayer bead bracelets and was conducted by a beautiful young woman named Allison, owner of Beading Dreams bead store in Dallas. 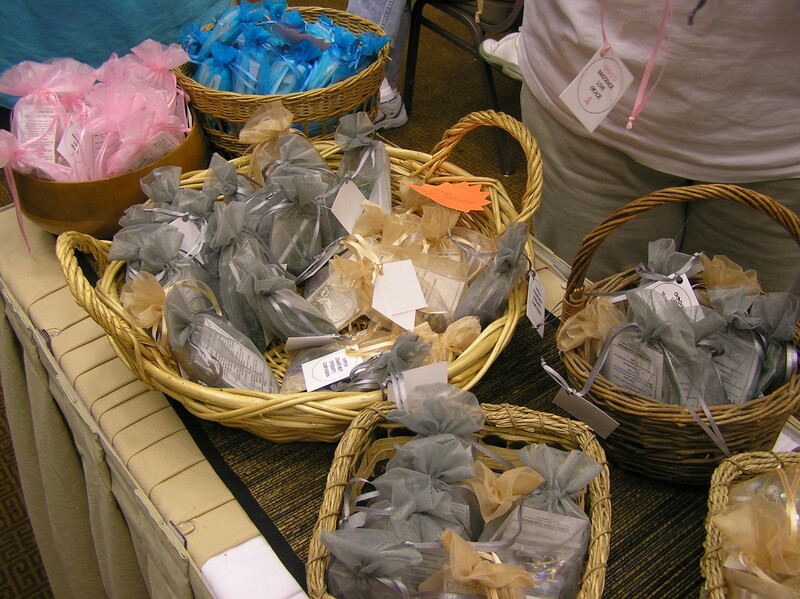 Allison brought with her perhaps a dozen baskets in which she had placed scores and scores of small, pastel-hued organza bags, each of which contained the components of a prayer bracelet – beads, charms, flexible wire, a clasp and a couple of crimp beads. 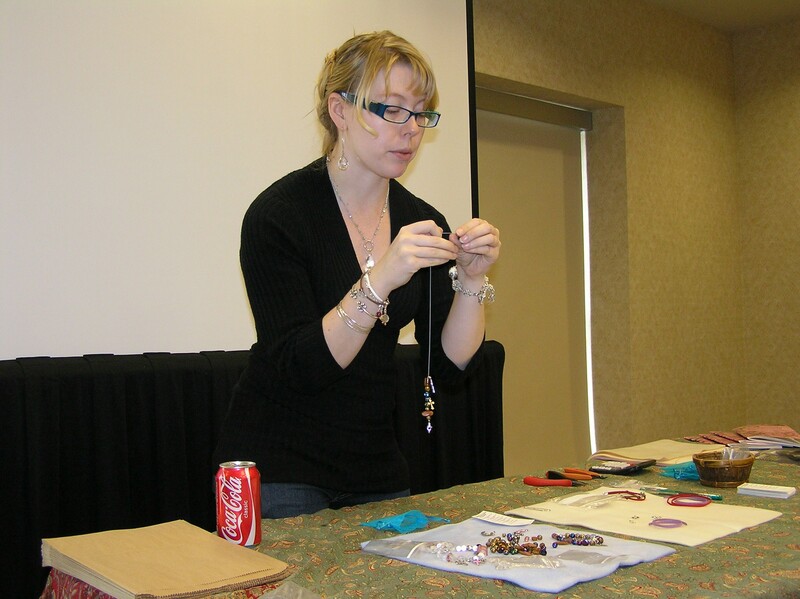 In two separate sessions, she demonstrated how to string beads, measure the resulting strand to one’s wrist and close it off with a crimp bead. The bags were organized by the color of beads they contained and Allison very helpfully described the spiritual and healing properties of each color on the label of each bag . . . .
As a thank you for helping her set up and tear down (and also cause she’s just a doll!) Allison gave me one of the kits and I brought it back to California with me. When I opened it, I found inside a half-dozen small silver-colored charms – a couple of crosses, one that said “Faith” and one that said “Love” and, I was excited to see, one of a woman sitting cross-legged in meditation. There was also a full handful of purple and blue glass beads. Best of all was that Allison included a strand of Softflex that came with a lobster claw clasp already attached at one end with a crimp bead! She had done half my work for me, enabling me to immediately begin stringing beads without having to first get out my tools and attach the clasp! And imagine my joy when I discovered that all the charms came with split rings already attached. No getting out that awful tool that is supposed to open split rings, but ends up breaking my nails instead. 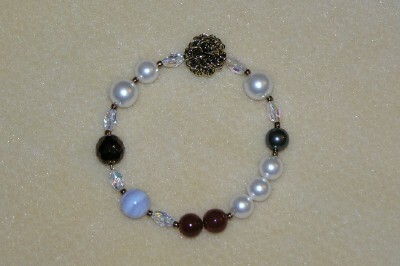 A crimp bead, a jump ring and a small card printed with instructions for assembling the bracelet completed the kit. I got right to work (or play!) with the beads. I happen to be a person who likes order and routine – probably one of the main reasons prayer beads, with their regularity and rhythm, appeal to me in the first place. So I automatically began stringing them in a pattern: one round bead, one long bead, one round bead, one charm, repeat. I was done in seconds. SECONDS. Three beads, one charm. I love the symbolism inherent in this pattern of 3 and 1. In Christianity, I see the Trinity and the one God. In Buddhism, it can mean the Triple Gem and the oneness of all things. In Wicca and other forms of Neo-Paganism, I see the three stages of a woman’s life – the maiden, mother and crone and the Goddess. In the New Age framework, I see the body, mind and spirit and the one being. I know there are many more. How to use this prayer bracelet? Because of the pattern of beads I used, I can take the bracelet off my wrist, hold it in my right hand, and say three repetitions of one prayer on the beads and one repetition of a second prayer on the charm – and repeat all the way around until I hit the clasp. I can say three Hail Mary prayers on the beads and The Lord’s Prayer on the charm, or I can say one of the prayers of Julian of Norwich – “And all shall be well and all shall be well and all manner of thing shall be well,” combined with the Jesus Prayer. I can pray anything on this prayer bracelet. That’s the beauty of it. There’s a link to Beading Dreams at the top of the page. 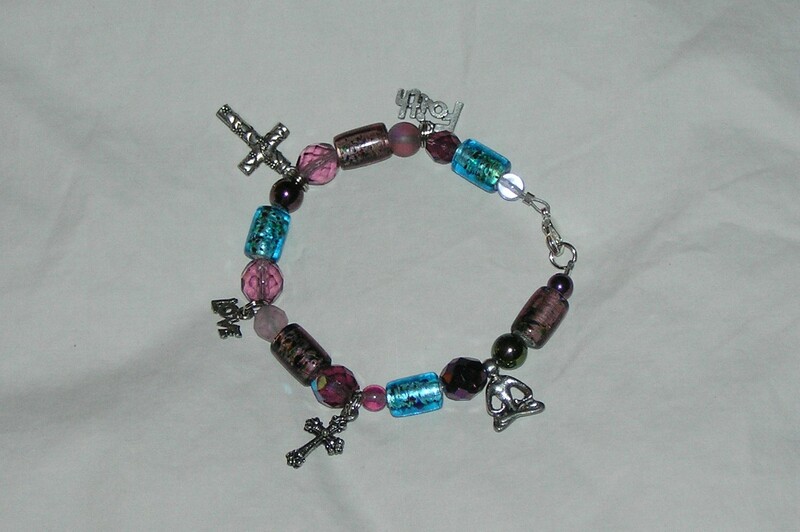 Allison has a lot of these prayer bracelet kits and I am sure she would love to send them out to readers of this blog. Giver her a call or drop her and email and tell her you saw her prayer bracelets on my blog. Happy Beading! Prayer Bead Maker Deborah J. A couple of nights ago, “Deborah J.” left a wonderful comment on my posting about Baha’i prayer beads in which she mentioned becoming inspired by Bead One, Pray Too to make a set of “healing beads” for a friend. I emailed Deborah back and asked if she would share a picture and a description of these beads. Well, the emails have been flying back and forth for the last 24 hours, and it wasn’t long before I discovered what a thoughtful, soulful prayer bead maker Deborah J is. Here are some pictures of her work – first, the healing beads, and second, a set of Pearls of Life she made for another friend – and the story behind them both. Be sure and note that she took the ideas of the traditional prayer beads in the book and made her own unique versions of them. First, a little about Deborah. She is in her 40s and “looks much younger, wink, wink” (meeeee tooo, Deborah!) and llives in Massachusetts. She has spent much of her working life in marketing, but is hoping to make a career change to orgnizational development. Deborah was raised a Catholic, though now she does not adhere to any one particular faith. Let me let her describe her faith: “I love learning about other religious tradtions and I always seem to find within them bits of philosophies that resonate with me. I consider myself deeply spiritual but not really religious. I truly believe that all paths lead to the same place. Right now I am exploring Yoga Nidra and perhaps it comes closest to describing my faith. I believe in a “Ground of Being” (I call it I AM) that is ever-present not only within us but is also around us and within every thing . . . My spiritual practice right now is focused on cultivating the awarness of this Presence in my every day life. -The heart is a Murano glass bead from Italy. It symbolizes love, of course, which I believe is an essential ingredient in healing. You might also be able to see the tiny spiral I made in the wire at the end of the bead. That represents the spiral of life. -The stem is composed of size 6 white silver-lined beads and peridot seed beads. The white symbolizes the “white light” of protection and as you’ve mentioned in your book peridot is known for having great power for healing illness. I don’t know if you can see it, but I used a white bead and a peridot seed in between the weeks beads. 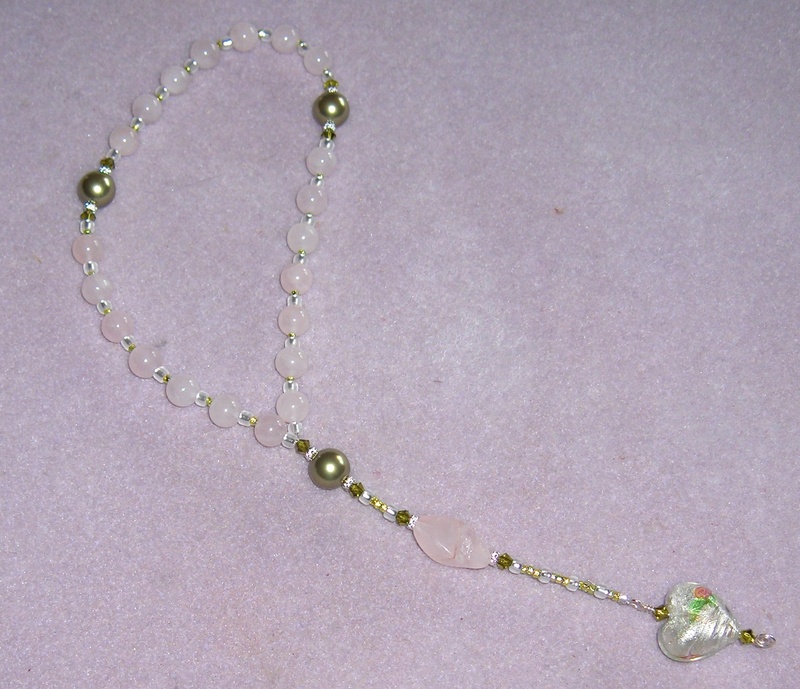 -The weeks beads are rose quartz, a stone of love that promotes peace, self-love, and healing. -The cruciforms are green Swarovski crystal pearls. I like the concept of pearls as reminders that out of difficulty can come great beauty (pearls are the by-product of an “irritation” in the clam.) The pearl is green because in the yogic tradition green is associated with the heart chakra. It’s also associated with spring, renewal, growth and healing. 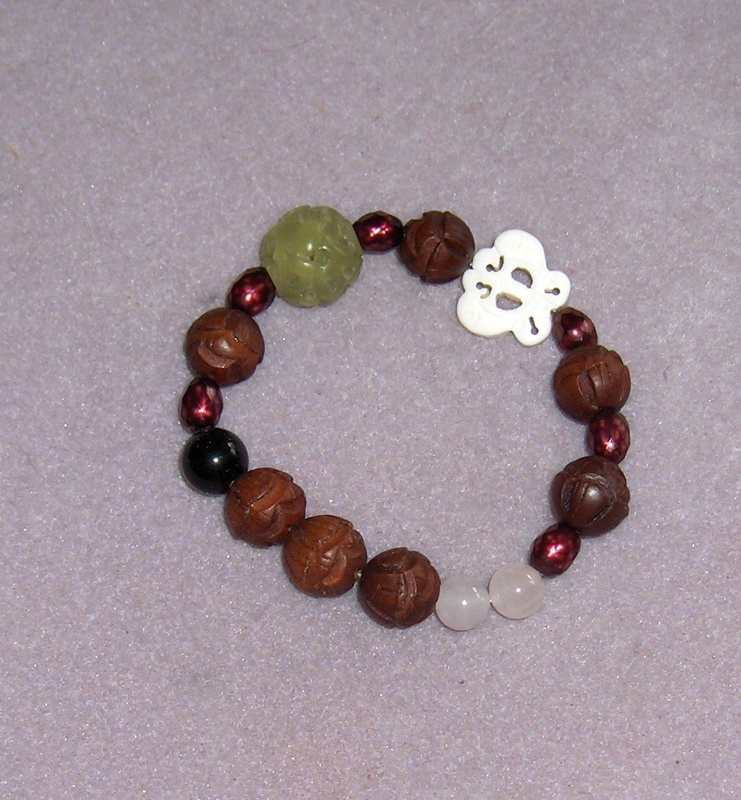 There are 3 sets of 7 beads – 3 representing the 3 aspects of self: body, mind, Spirit (or Soul or Essence). Seven weeks beads because as you mention in your book seven is a sacred number in many religious and mystical traditions (7 days, 7 sacraments, 7 chakras, etc.). “I LOVE the concepts for each of beads in the Pearls of Life. The philosophy reminds me somewhat of the Hero’s Journey. As I am going through a transition myself, that really resonated with me. The recipient has talked about going through “the ring of fire” to break through to a”core of peace”. She also talks about a butterfly in terms of transformation so when I saw the bead, it all seemed to come together. -God bead – beautiful carved Jade bead. It’s a hollow bead, with a lot of empty space which reminds of how God is in the “spaces between”, in matter, in between words (silence), in between space, etc. Jade symbolizes wisdom, peace, harmony, mercy and generosity. -Pearls of Silence- faceted seed pearls. Loved the ruby color. You know my thoughts on pearls. -I Pearl, Baptism, Mystery, Serenity – the carved wooden flower beads just jumped out at me because the recipient has an affinity for Africa. I guess you could call it an “intuitive hit”. -Love Pearls are rose quartz symbolizing love, forgiveness and healing. -Night Pearl is a beautiful deep blue stone with gold flecks. Seemed pretty indicative of the night to me! -Resurrection Pearl – saw the butterfly bead and well, enough said. Look to hear more from Deborah J in the future – I made her promise to continue to send me pictures and descriptions of her work.